I am the proud owner of this lovely 27 year old Arabian stallion. Cajun Mandate+\\, Cajun, is still competing, in large part due to the added benefits I can offer him with the help of SmartPak. As he ages, his needs differ from the other 35 horses in the barn. With SmartPaks I know I can keep him looking and feeling great and staying sound, while attending to his individual needs. At age 26 he was again named East Coast Champion in Trail! We also enjoy judged trail rides together, and I am confident with SmartPak’s help, that we can keep going that extra mile! 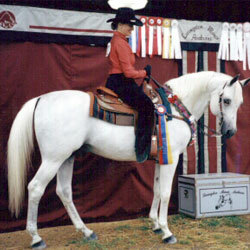 Cajun’s SmartPak: Continuex SmartFlex III Ultra TractGard .